It's been a nostalgic weekend for me, meeting the first Asian-Canadian NHL hockey player Larry Kwong, and re-reading a book about Ann May Wong. Here's a link about a pioneering Asian-American performer, Jadin Wong. I wonder if she knew my grandmother's uncle Luke Chan, who also performed in some early Hollywood movies such as The Good Earth, The Mysterious Mr. Wong and many others. appointment to perform with Bob Hope for U.S. troops, her family said. life after launching her career in San Francisco. mother raised the family's six children. home at 17 to pursue a performing career. Hollywood, with $45 secretly given to her by her mother, Wong said. When live theater began to falter with the advent of television, Ms.
became paralyzed by a stroke four years ago, Wong said. better roles, Lee and Wong said. and for opening doors for other Asian Americans entertainers. This entry was posted in Main Page on July 27, 2010 by Todd. Joe Wong is an immigrant American-Chinese comic…. or is Joe Wong a Chinese-American comic? My friend Jim Wong-Chu just sent me some links to youtube videos of comic Joe Wong. last night in Penticton. July 23, 2010. This was a special award that was created so that the 82 year old Vernon-born hockey player could be honoured. It was sponsored by the Okanagan Hockey School. Chad Soon has been leading the drive to have Kwong inducted into the BC Hockey Hall of Fame. I met Chad at Christmas time, and he was excited enough about Larry Kwong's place in hockey history, that he has been contacting hockey card companies, hockey teams, and other organizations that would support such a campaign. Chad contacted me two weeks ago and told me that the award would be presented to Larry. It was a coincidence that I was planning to be in the Okanagan that same weekend, so I purchased the ticket to the BC Hockey Hall of Fame. also plays host to concerts. It was a wonderful setting with over a hundred tables set up inside the hockey rink boards. Banners from each year listed the names of that year's inductees. There were tables filled with silent auction prizes that ranged from gift certificates for restaurants to signed Vancouver Canucks jerseys by Trevor Linden and Roberto Luongo, to holiday getaways. I chatted with Chad's wife Zoe, while Chad helped Larry get settled with his daughter and grand-daughters at their table. 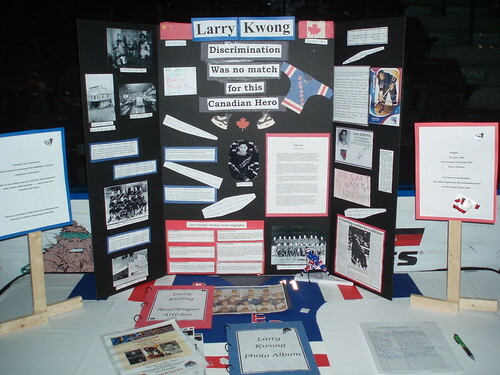 Zoe pointed out a display about Larry Kwong that had been created by one of Chad's elementary school students, Gavin Donald, who had one a prize at the Vernon Regional History Fair. Kenda Gee, came by to say hello and ask me to sign a release document, as the Chinese-Canadian history activist is producing a documentary film about Chinese Canadians which will also feature Larry Kwong. There was a 90 minute reception period during which Chad went around the room, trying to get the signatures of the inducted hockey players on a hockey stick to be gifted to Larry. Dinner was served around 6:30pm. Roast beef, chicken, roast potatoes, greek salad, spinach salad, pasta salad, steamed vegetables…. all good meat & potatoes food for hockey afficianados. When the awards portion began at 7pm, some announcements were made that recognized the hockey achievements in BC including the Canadian Mens and Womens Olympic hockey teams winning gold in Vancouver Olympics. Emcee Bernie Pascall then asked guests to turn their attentions to the screens as a video titled “The Longest Shot” began. It told the history of a baby born born in Vernon to a Chinese Canadian family just days before Canadian Parliament enacted the “Chinese Exclusion Act”. The audience learned that Larry Kwong played for the Vernon Hydrophone and won the midget and junior BC Championships in 1939 and 1941. He also played with the Trail Smoke Eaters and the Nanaimo Clippers where all the other team players were able to have jobs in the local factory, except for Kwong because he was Chinese. The narrator told of every BC hockey playing boy's dream of getting called up to the NHL, as Larry was called up to the New York Rovers, the NHL farm team for the New York Rangers. Then during the 47-48 season he was called up to NHL. Larry suited up at the Montreal Forum March 13, 1948. He said that Larry sat on the bench for the first period, the second period and most of the third period… before hearing his name called. At the Montreal Forum, Larry Kwong stepped onto the ice for his first NHL shift. A minute later, it was over, and his name wasn't called again. Larry didn't let the bitterness of a colour barrier stop him from enjoying playing hockey. He loved hockey. Kwong had an exciting and long amateur and minor league career with the Valleyfield Braves of the Quebec Senior League where he played against future NHL stars Jean Belliveau and Jacques Plante. 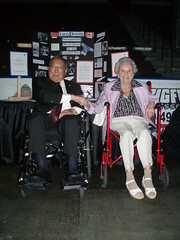 In 1951, Kwong was the recipient of the Byng of Vimy Award for Most Valuable Player of the Quebec Senior League and as assistant captain, he helped to lead the Valleyfield Braves to the Alexander Cup, the Canadian Senior “A” Championship. When the film was over, Larry was on stage in his wheel chair. He uses a wheelchair because a few years ago his legs had been amputated for health issues. Our group of tables were the first to give Larry a standing ovation. Gavin and his mother stood up. Chad and his wife and father stood up. Larry's 2 grand-daughters and daughter stood up. And soon the entire audience was standing up clapping, while Larry waved to the crowd and gracefully accepted the appreciation. The next two awards to be awarded was the induction of hockey builder Frank Lento and hockey player Dallas Drake. There was a 20 minute break for Live Auction items. Then the next two inductees were introduced, hockey builder Bruce Hamilton and hockey player Trevor Linden. There was a video that recounted Linden's career with the Vancouver Canucks, his time spent with New York Islanders, Montreal Canadiens and Washington Capitals, as well as with the Canadian Olympic team in Nagano Olympics in 1998. Linden was introduced by Pat Quinn, the man who drafted him second over-all in the 1988 junior draft. 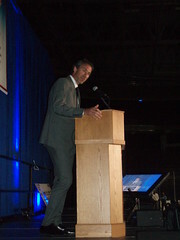 It was very clear that Trevor Linden's induction was the highlight of the evening. over, Trevor was congratulating Larry Kwong. Larry also came to Vernon Museum on Saturday July 24, for a special reception, to meet supporters. 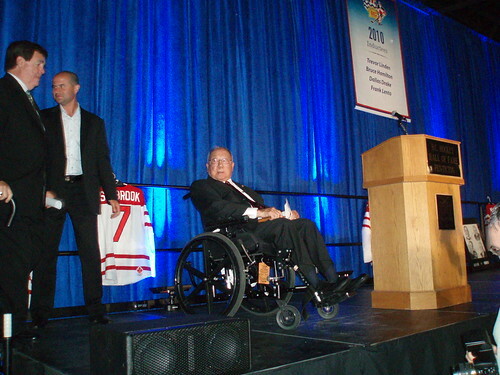 Attending the BC Hockey Hall of Fame event was a different and unique experience for me. I was surrounded by “jocks!” Everything was hockey players, hockey coaches, hockey builders! The silent auction items were hockey pictures, hockey equipment, etc. Even though I've been a hockey card collector since I was 8 years old, and attended a few games – this was really like stepping into a whole new world. It was exciting to see such hockey legends as Trevor Linden, Pat Quinn, Ken Hitchcock all in the same room! What fun! Here are my pictures from the event. This entry was posted in Main Page on July 24, 2010 by Todd. 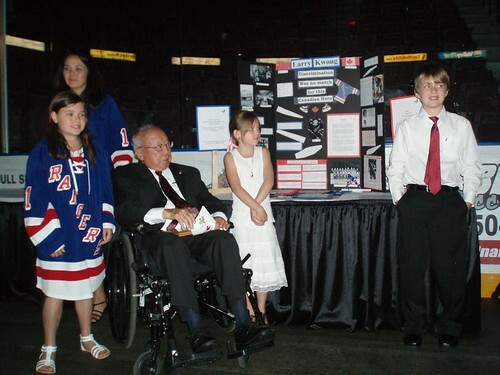 Vernon student creates history project on Larry Kwong, and wins prize trip to Barkerville! Vernon and District Heritage Fair. last night's BC Hockey Hall of Fame induction dinner. I was surprised at how much compassion and information that Gavin conveyed when he talked about Larry Kwong. Gavin is passionate about his hometown of Vernon, and really wanted to choose a person from Vernon for his project. The young man beside me wore a tie, and was thrilled to meet Larry Kwong at the BC Hockey Hall of Fame Dinner last night in Penticton. Even though the induction of Trevor Linden, one of the greatest hockey players to wear the “C” for the Vancouver Canucks, was undoubtedly the evening's highlight – Gavin was only there to meet his hero – Larry Kwong. When MP Stockwell Day came over to meet Larry Kwong, it was Gavin who quickly had a pen in Day's hand to sign a petition to nominate Larry Kwong for the BC Hockey Hall of Fame. By the end of the evening, Gavin was proudly carrying a newly won silent auction prize of a goalie stick signed by Mikka Kipprusoff, and asking other of the inducted hockey players Trevor Linden, Dallas Drake to sign the stick. An evening highlight for Gavin was having Larry Kwong add his signature that same goalie stick. sickening that someone would not have a chance because of their race. This entry was posted in Asian Canadian Cultural Events, Canadian Identity & Heritage, Chinese Canadian History, Commentaries, Main Page on July 24, 2010 by Todd. I journeyed to Vernon for some vacation and to attend a historic event. 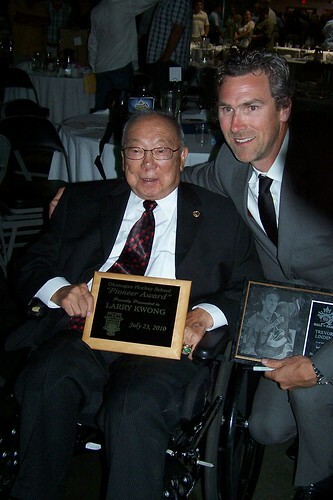 Larry Kwong the first non-white to play in the NHL, way back in 1948, will be honoured with the inaugural Pioneer Award at the BC Hockey Hall of Fame Induction ceremony Friday July 23, in Penticton. The Vernon-born Kwong, will also be in Vernon for a special reception at the Vernon Museum on Saturday, August 24th from 12 noon to 12:45pm. Kwong played junior hockey in Vernon, then with the Trail Smokeaters, before joining the New York Rangers of the NHL. Due to racial colour barriers in North America at the time, he later played in England and Switzerland. This entry was posted in Main Page on July 23, 2010 by Todd. “25th Annual Putnam County Spelling Bee” delights!!! I first became interested in spelling bees after my 2nd cousin Tracey won the inaugural Canspell regional spelling bee in the Vancouver region. At the young age of 14, she then went off to the Scripps National Bee in Washington DC, and the Canspell National in Ottawa where she placed in the top 5. I diligently followed the emails that her mother sent the family. Next I watched the movie Akeelah and the Bee, about a young child becoming involved in a spelling Bee, and being trained by Laurence Fishburne's character of Dr. Larabee. Richard Gere also starred in the movie Bee Season. This play captures all the silly ideas of the importance of spelling bees as well as the serious undercurrents of perfectionism and high expectations placed on the young competitors of these contests. This is afterall a musical. And musicals are meant to be fun and light. And this musical delivers on all accounts… except I don't know if I can hum any of the tunes… but I was humming something when I walked out of the theatre. spelling syzygy. It brings a certain emotional induction to the theatre play, as I recalled watching the CBC documentary Generation: The Chan Legacy, that showed tv film footage of my young cousin Tracey spelling her word at the Canspell contest. There are five contestants that are supplemented by four “contestants” chosen from the audience. This adds to a wonderful spontaneity for the play, as each night will be different with the audience members chosen. This play is also a wonderful fit for multicultural Vancouver. Two of the characters are Asian. Chip Tolentino is a boy scout having issues with puberty. This returning champion of last year's contest is played by Vincent Tong. Marcy Park is an over-achieving recent transplant that sings “I Speak Six Languages” and played by Rosie Simon. This is a fun play and perfect for a summer evening of fun. 25th Annual Putnam County Spelling Bee has been extended until August 25th. This entry was posted in Literary Events, Main Page, Recent Reviews, Theatre on July 23, 2010 by Todd. Vancouver Folk Fest merges musical cultures in fun ways! This year's Vancouver Folk Fest has some very interesting performers from around the world. Some of the performers present traditional music in different settings, or create entirely new forms. I dropped in on the festival on Saturday evening. I had really wanted to see Namgar at 4pm, but was still finishing up after the Richmond Dragon Boat Festival. While parking my bicycle in the special bike lot (it's a tradition to bike to the festival), I heard my name called, and turned around to see Spencer Herbert MLA for Vancouver West End. Spencer is also arts critic for the BC NDP. He has always been an amazing activist and arts supporter, since I heard his mother Donna Spencer speak so highly of his activities back in 2002. Spencer had spent the day at the Festival, and told me he had also gone swimming in the ocean. The Vancouver Folk Festival's proximity to English Bay, is such as wonderful environmental ascetic. The performances at dusk and in the evening take on a different atmosphere as the stage lighting now begins to make an impact. The lanterns from the Public Dreams Society are also gently paraded throughout the crowd. I saw lanterns made in the designs of fish and stars and other shapes, all adding to the wonderful magical atmosphere. Fortunately I was able to see Sarah Harmer, whom I have really enjoyed listening to since I discovered her “I am a Mountain” cd. With her new pop sound, she really had the crowd moving. Her recent activism in helping to bring attention to stop development on the Niagara escarpement has really endeared her to the environmental crowd. Curls play the fiddle, ukulele, traditional Maori and other instruments. influenced legendary musicians like BB King and Bob Dylan among others. It’s also been a major source of inspiration for our own Steve Dawson. This entry was posted in Main Page on July 18, 2010 by Todd. It was a beautiful day at the UBC Rowing Centre in Richmond, just east of the Dinsmore Bridge. The Gung Haggis Fat Choy dragon boat team arrived early and set up their tents and readied their crew. This year there were only 12 teams entered in the Richmond race, compared to the 30 teams last year. People kept asking what happened? Why are there less teams? My reply is that there are many dragon boat options for teams, with races last week in Nanaimo and Kent WA. Next week teams will be going to Harrison. Vernon had originally be set for July 24/25, but was canceled due to low numbers, said the organizers. As well, last year's race grid eliminated the bottom teams that didn't qualify for finals. Only the top 16 teams competed for medals + 2 teams for the cancer survivor challenge + 4 teams for the junior challeng. But the Richmond event went bravely on with 12 teams. We were warmly greeted by Fred, of the Fraser Dragons teams, who explained to us how tents were being set up on the plastic floor segments that were placed on top of the renovated dike along River Road. With less teams, there was more room for each team. Last year there was fresh bark mulch dirt on the top of the new dike that had been raised. Last year there was long grass along a much lower dike. The first set of races were head-to-head races with only two teams each. This meant 6 races. Teams watched each other race. Many of the races placed strong mixed teams against all-women teams, that were noticeably slower. It was a format that was being used to try to find a clear race grid to make sure all the teams would be placed within their level. Gung Haggis team raced against Richmond Survivorship. In the line-up were cheerfully talked with the team of female cancer survivors. 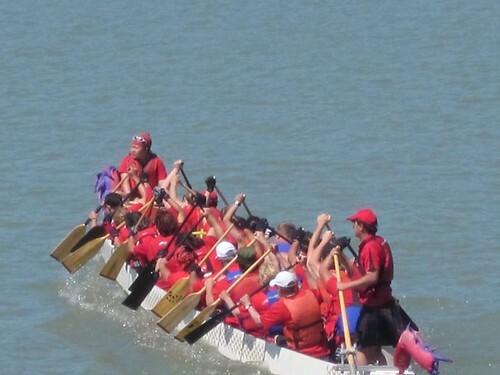 We told our team to race their own race, and to get comfortable with the calls, the Millenium dragon boat, and the paddlers around them, as a few of the paddlers had not practiced with us. Our roster was filled with many of our team's core paddlers captained by Jim Blatherwick who diligently worked out our lineups. Tzhe and Christine were our lead strokers with Karen R. joining Jim as mid-stroke. We also added two new paddlers such as Guillaume who is on a work visa from Belgium, and Chris who had only about 5 practices since joining us after the Rio Tinto Alcan Festival. Experienced paddlers such as Steve and Cristina joined us from Metro Vancouver 44 Cheeks. They had raced with our 49+ team at RTA. Lisa and Dominic are experienced paddlers on other teams, that raced with us last year at Richmond, and join us when they can because they enjoy our team's camaraderie. Dan first started on our team back in 2004, but joined other teams in the quest for higher competitive levels. But he always enjoys paddling with us and had also joined us in May for the Lotus regatta in Burnaby, as does Thony, originally from the Phillipine PYROS team, but has now started a team for Phillipine paddlers in Vancouver. Dominic enjoys paddling with Gung Haggis so much, he turned a tartan sash into a tartan head wrap! – photo courtesy of Dave Samis. Debbie was our drummer. Her calls were strong, as we had trained her for the RTA Festival. Todd was our steers. As coach for the team, he also looked to see how the team was working together and made changes and critiques where needed. Gung Haggis Fat Choy had a good start and we quickly out paced the Richmond Survivorship before we paddled under the Dinsmore Bridge from the Finish Line. Throughout this set of six races, we watched the other team's times to see who were the fastest that we would meet in the A Final. Three teams had faster times than us. The second set of races included 3 boats per heat. Each race featured one of the winning boats from the first set of 6 races. This helped to further sort the teams. We raced against two teams that we handily beat. We now put Keng on the drum seat, and Dave Samis as steersperson. For the final race, we were joined by our “Buddy Team” Flight Centre, plus Booze Cruise, and the junior team Surgin' Sturgeons. The river was flowing down faster in the mid-afternoon. Booze Cruise had the outside lane, we were next. Flight Centre on our right, closer to shore, and Surgin' Sturgeons closest to shore. The horn sounded, and we all dug our paddles hard into the water. Booze Cruise jumped ahead with a mighty start. We moved into our power series, and started to leave Flight Centre behind. Keng called some power series, as Dan called “Push” to the backs. We dug our paddles deeper. We reached for the front water to pull our boat up more. We came 2nd. YAY!!!! Silver medals were headed our way. Much sweeter than the split-second lost last year when we came 4th in A Division. But last year being in A was an unexpected treat. This year we knew that we had to be in A – but where? Next came the challenge race. A course was set up, and teams had to make a left turn, then turn right around a far boy, then make a left turn on the far side, then come through the narrowly spaced buoys marking both the start and the finish. We saw the first teams out-shoot the turns and end up making really wide turns. We saw some teams disqualified because the turned around the wrong buoys or missed the finish gate completely. As we climbed into the boat, I told our paddlers that Gung Haggis Fat Choy had been the first Canadian team to do dragon boat barrel races in Seattle, organized by Tacoma DBA. It was myself and Bob Brinson who brought the concept to the Taiwanese dragon boat races, and it spread to Harrison. I had steered those races and helped develop the concept, so some of our core members remembered those races and how we paddled to make tighter turns. We did our start through the gates, banking left. I steered our boat wider to enter the turn, so we would have a better angle with the river's downstream current hit us. Debbie and I yelled turn, and our paddlers went into action, using a draw stroke to help us get around the turn. The far buoy turn was tough. The river pushed us down stream, and I had to turn us slightly upstream to cross the river and get around the final turn. I made a great turn, and we raced to the finish gate with the best angle that any boat had done. Our friends on the shore watching, later told us that the announcer had complimented our turns, as he gave us the best time, setting a record fastest time for the course. As we docked, lots of the fellow racers and dock volunteers cheered for us. We had the fastest time by 20 seconds. Wow! They called up the winners from each of the C, B and A divisions. 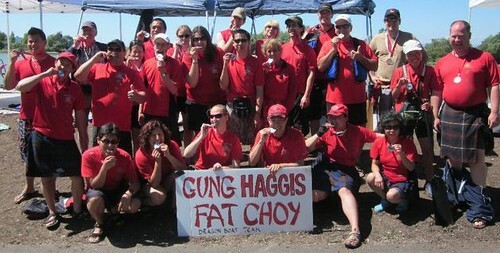 They called Gung Haggis Fat Choy and gave us the silver medals for A division. They asked us to wait, as they awarded us the prize for the Challenge race too. – Free registration for next year's Richmond dragon boat race! Everybody on our team had a great day. We complimented each other, as well as our friends on other teams. 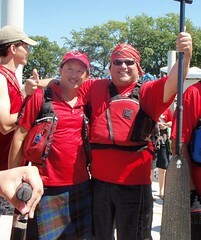 This entry was posted in Dragon Boat Information, Dragon Boat photos 2003, Dragon boat with Todd Wong - Dragon Boat Coach, Gung Haggis dragon boat team information, Main Page, Vancouver Area Adventures on July 18, 2010 by Todd. LARRY KWONG – the first Chinese-Canadian NHL player, will receive the first annual PIONEER AWARD from the Okanagan Hockey School. Larry Kwong is one of Hockey's great trivia questions. Who was the first non-white hockey player in the NHL? He played one shift in the 3rd period against the Montreal Canadiens, in Montreal in 1948. – photo courtesy of Chad Soon. 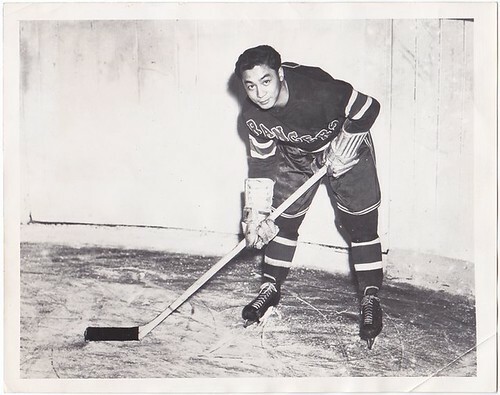 During the 1947-48 season, Larry ('King') Kwong is the first Chinese Canadian to play in the NHL as a member of the New York Rangers Hockey Club. 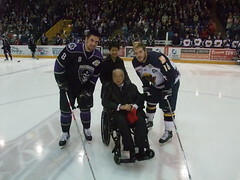 Also known as the 'China Clipper' during an illustrious juniors and seniors hockey career in B.C., Kwong went on to become Assistant Captain of the Valleyfield Braves in the Quebec Senior Hockey League where he led the team to a Canadian Senior Championship and received the Byng of Vimy award for sportsmanship. Kwong later accepted an offer to play hockey in England and coach in Lausanne, Switzerland. person of Asian descent to play in the big league. 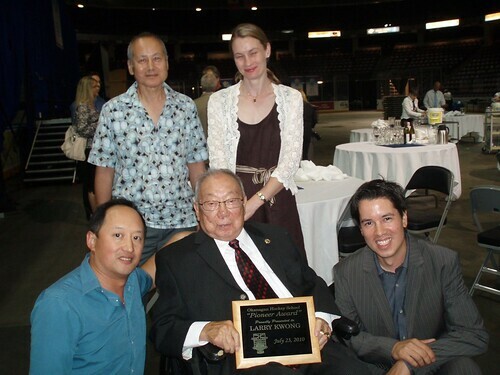 “Our goal is to see hockey hero Larry Kwong recognized for his pioneering achievements — his contributions to the game and to our society. leave plenty of room for a puck to squirt in at either end. Vernon Vipers before their BCHL (Junior A) playoff game. – photo courtesy of Chad Soon. Larry's nomination for induction into the BC Sports Hall of Fame. On March 27, Larry made a triumphant homecoming to Vernon, BC. He was honoured by the Vernon Vipers before their BCHL (Junior A) playoff game, and received a rousing three-minute standing ovation. The Vernon Vipers also issued a “hero” card of Larry. Barry Marsman of SONAHHR presented Larry with a special Heritage Award in honour of the 60th anniversary of his breaking the NHL's race barrier. This entry was posted in Asian Canadian Cultural Events, Canadian Identity & Heritage, Chinese Canadian History, Cultural Fusion, Main Page, Multicultural events on July 16, 2010 by Todd. 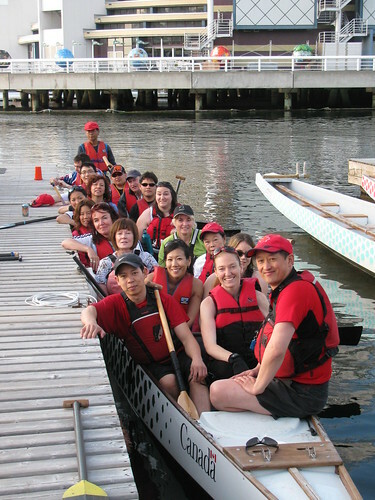 We had our last practice on Tuesday evening, to prime our team for the Richmond Dragon Boat races set for this Saturday July 17. It was the first time we had 20 people in the boat for awhile, since getting ready for the Alcan Rio Tinto Dragon Boat Festival on June 19 & 20. The team is looking mighty nice. We worked on starts and transitions. We rotated 2 drummers Debbie and Keng, as well as 2 steers – myself and Dave. Our first race will be at heat 2 @ 10:10 at the UBC Rowing Centre in Richmond, against Richmond Survivorship. Our 2nd race should be at Heat 8 @ 11:30, 3rd race Heat 11 @ 12:45. We hope to make it into the Grand Final at 2pm. Last year we made it to the A Final, and were a split second from the bronze medal. This year we hope to medal in the A Final. 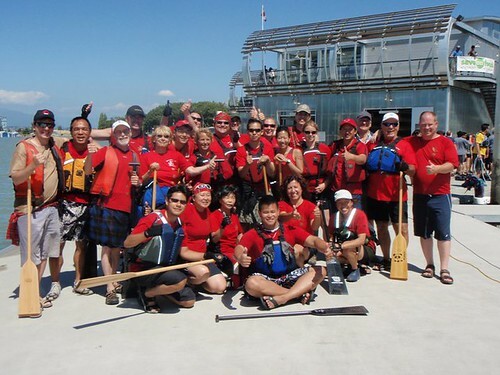 This entry was posted in Dragon Boat Information, Dragon Boat photos 2003, Dragon boat with Todd Wong - Dragon Boat Coach, Gung Haggis dragon boat team information, Main Page on July 15, 2010 by Todd.